“The ASC label is complimentary to the Marine Stewardship Council (MSC) label; which is used on certified and sustainably wild caught fish,” claimed a press release issued by the ASC (17 April). Action Alert – Act Now Against Industrial Salmon and Shrimp Aquaculture! Please act now to stop WWF and the Aquaculture Stewardship Council giving the green light to farmed salmon and shrimp. Just as WWF urged people to turn their lights off to make a stand against climate change during Earth Hour, GAAIA is asking you to take a stand against industrially farmed salmon and shrimp. Please write to WWF and the Aquaculture Stewardship Council urging them to give farmed salmon and shrimp a red light and demand that the plug be pulled on standards and certification. WWF's farmed salmon standards are being drafted and are expected to be published in mid-2011. More details from WWF's Salmon Aquaculture Dialogue. Keep updated on WWF's farmed shrimp standards via the Shrimp Aquaculture Dialogue. The Global Aquaculture Alliance's farmed salmon standards were issued for public comment in late 2010 with a deadline of 20th January 2011. The GAA's standards were immediately criticized by the David Suzuki Foundation and Living Oceans Society as "weak" and "ignoring environmental impacts". Join the Global Alliance Against Industrial Aquaculture in the fight to protect the health of our global ocean, the health of consumers and the health of coastal communities around the world. Raising standards on salmon and shrimp farms is a laudable goal but standard-setting bodies and certification schemes have now hijacked the agenda. Trying to fit salmon and shrimp into a standard or certification scheme is like trying to force a square peg in a round hole. GAAIA believes that there can be no accommodation for salmon and shrimp in ‘sustainable’, ‘environmentally friendly’ and ‘socially responsible’ schemes run by the Global Aquaculture Alliance and Aquaculture Stewardship Council in particular. The ‘Aquaculture Dialogue’ process has been used as a Trojan Horse by WWF and the Aquaculture Stewardship Council. The certification of farmed salmon and shrimp is presented as a fait accompli and a done deal clearly influenced by major retailers and multinational companies with a vested interest in peddling ‘sustainable’ farmed salmon and shrimp. The Aquaculture Stewardship Council’s Development Director is Dr Phillip Smith who was formerly with Nutreco – the largest fish feed company in the world and former owner of the world’s largest salmon farming company Marine Harvest. And Jose Villalon, who oversees WWF’s ‘Aquaculture Dialogues’ and is a member of the ASC’s supervisory board is a former shrimp farmer who used to work for Marine Harvest International's shrimp division in Ecuador. He openly admits: we were shrimp cowboys". The ASC has already been heavily criticized by NGOs around the world. In May 2009, for example, over 70 international NGOs from five continents expressed opposition to the formation of the ASC in a letter to WWF. “Over the last two decades, local communities and traditional resource users have borne the brunt of the race to grow prawns for the consumers in the West,” said Dr. Maurizio Farhan Ferrari, environmental governance coordinator for the Forest Peoples Program in Gloucestershire, England. “Local communities are kept at a distance from shrimp farms by barbed wires and guards. In cases where local people are enticed into the business, the contract farming systems put in place by large aquaculture corporations to farm shrimp and salmon tend to be highly exploitative, offering little in terms of income or security for workers on the farms themselves.”. "Salmon farming opponent the Pure Salmon Campaign blasted the standard. "Any standard which merely rewards the status quo and allows open-net cages to continue to pollute our global oceans via infectious diseases, toxic chemicals, sea lice, escapees, untreated wastes and uneaten feed is not worth the green-washed paper it is written on. Marine Harvest would have us all believe that the industry has come a long way and made significant progress but the ongoing spread of ISA in Norway and increasing chemical resistance to sea lice serves only to remind us that even the trumpeted industry leader is lagging behind in the Dark Ages," said Don Staniford, global coordinator for the Pure Salmon Campaign. "By cravenly kowtowing to Marine Harvest --with whom WWF Norway has a financial relationship via their 'partnership for sustainable aquaculture' -- and pandering to the vested interests of retailers who are demanding 'green' farmed salmon, WWF risks losing the precious little credibility it has left," said Staniford. "Likewise, if the Aquaculture Stewardship Council, whose current Director is a former Managing Director of Marine Harvest Europe, certifies salmon farmed in open net cages then it will be mocked as a watered down version of the much-maligned Marine Stewardship Council. For if the MSC has the gall to certify Antarctic krill and wild Fraser River sockeye salmon then you can bet your bottom dollar that the ASC is casting its beady eye towards open net cage farmed salmon and intensively farmed Mangrove-friendly shrimp." 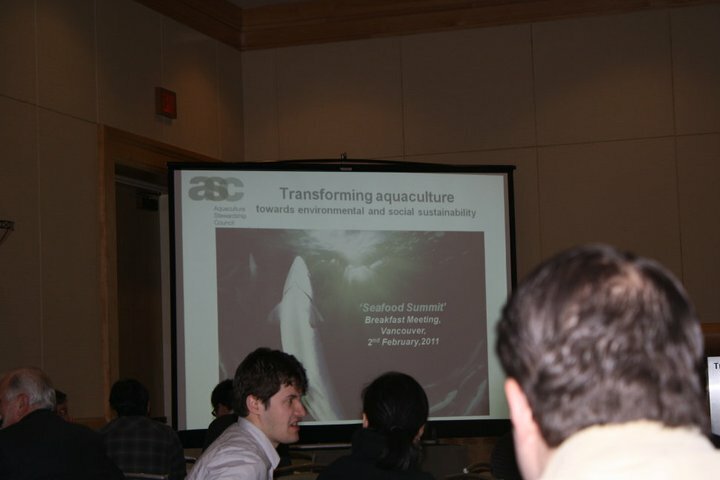 GAAIA’s crusade against industrial aquaculture kick-started in Vancouver in February 2011 at the Seafood Summit in Vancouver at a breakfast 'informational meeting' hosted by the Aquaculture Stewardship Council. 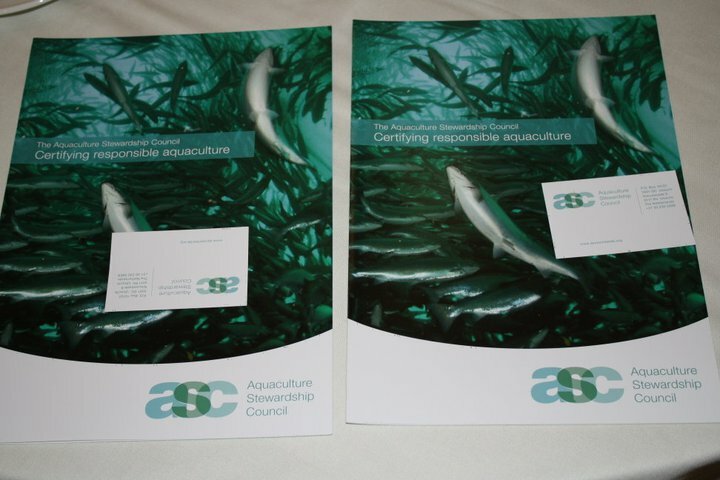 The Aquaculture Stewardship Council (ASC) is on a ‘mission’ (according to it’s glossy new brochure with farmed salmon slithering all over the front and back cover) “to transform aquaculture towards environmental and social sustainability”. Common sense would surely dictate that any move “towards environmental and social sustainability” meant running as fast and as far away from salmon farming as possible. However, in view of the way the ASC (crammed full of former Marine Harvest staff) is warmly embracing salmon farming, it sadly seems that common sense is not a currency the ASC is going to deal in. Big Aquaculture like Big Tobacco is used to making big mistakes. As the ASC (Advertising Standards Canada) says: "Truth in advertising matters". The ASC (Aquaculture Stewardship Council) would do well to remember that when it comes to marketing farmed salmon.